Dunlopillo Latex Pillows are presented on the world market for over 80 years and successfully compete with the market leaders of bedding. Dunlopillo company was established in England. Thanks to Mr E.A. 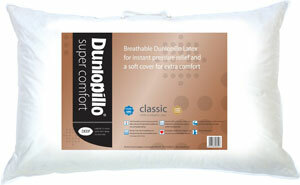 Murphy, Dunlop scientist, was founded the best method of making Dunlop latex pillow, which is used to this day. Through years of experimentation Dunlop managed to achieve high quality of its products. While many pillows lose their original shape every day of use Dunlop latex pillows retain their shape and quality for many years. Warranty on the pillows is five years. 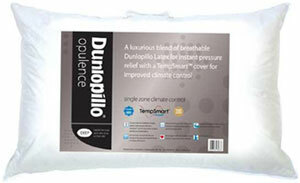 All Dunlopillo products are completely hypoallergenic, so if you are prone to allergies you should pay attention to the products of this company. Dunlopillo latex pillow supplied with unique Tempsmart pillowcase. It adapts to your body temperature to ensure maximum comfort during sleep. We can not allocate one pillow and say, “This pillow is exactly that you need”, as they are all great. It sometimes happens that the pillow will be too soft for one customer, while for the other it suits perfectly. So we do not recommend to you immediately remove the protective film from the Dunlopillo latex pillow after it came to you, because then you will not be able to return or exchange it. If you’re already familiar with the some Dunlopillo latex foam pillows please do not hesitate to leave a review. Perhaps due to your review someone can make the right decision.